Five years after Godzilla’s second rampage through Tokyo, an illegal experiment grafting the monster’s cells to a rose results in the creation of an entirely new giant creature – one like Godzilla, but plant rather than animal-based. When Godzilla himself returns from his five-year slumber inside an active volcano, it is inevitable that the two monsters come face-to-face. 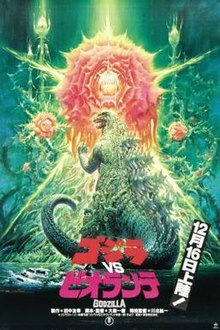 Godzilla vs Biollante, directed by Kazuki Omori, marks a solid progression in style and tone from its 1984 predecessor. While that was a well-developed disaster film that paid close homage to the 1954 original, Biollante shifts the Godzilla franchise firmly towards science fiction. It is human experimentation that creates another giant monster, and that experimentation has a believable and even laudable purpose: to bring drought-resistant crops to a fictional desert nation. The same appeal of Godzilla clearly continues in this somewhat more sophisticated sequel. The giant monster scenes show a visible increase in quality and suspense – particularly a mid-film confrontation between the titular creatures in a lake. Biollante goes through two key changes in appearance as it evolves over the course of the film. The mid-film version – a giant tentacled rose bush – is quirky but effective. The climactic version -a giant crocodilian plant-lizard hybrid that towers over Godzilla – is remarkable. It is one of the best-looking kaiju that the franchise ever had. The film not only functions as a giant monster smack-down, but also as a rudimentary espionage thriller. With a new radiation-eating bacteria developed to combat Godzilla, that technology is targeted by two rival agencies while the Japanese authorities struggle to keep it firmly in hand. It is not outstanding stuff, but it is certainly entertaining – and adds a welcome new aspect to the story. The performances are melodramatic and simplistic, but then they usually are. Kunihiko Mitamura and Toru Minegishi play reliably charming and bold leads. Megumi Odaka gives young psychic Miki Saegusa an earnest presence, and another science fiction wrinkle to the film overall. Her appearance here is in a relatively small capacity, but she becomes a near-permanent fixture over the course of this ‘Heisei’ period of Godzilla films. It is a shame that Biollante did not perform well in cinemas, since its combination of science fiction, espionage, and disaster film marked a welcome advancement beyond simple rubber-suit and model carnage. Godzilla returned to the screen many more times, but sadly this is Biollante’s sole big-screen appearance. The character sits there waiting today, free for an enterprising Toho executive to pick up and re-use. The potential is – like Biollante itself – enormous.